Mama Kannon (“Kannon” means the Buddhist Goddess of Mercy) is a unique temple located to the north of Mt. Komaki. 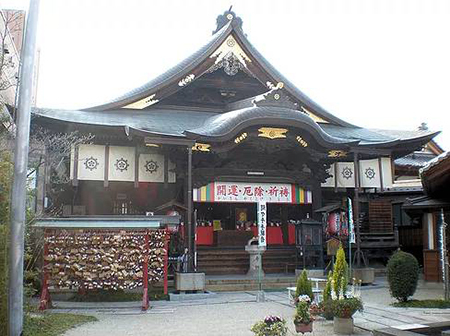 If you are planning a short visit to Komaki, you won’t regret taking a little extra time to visit Mama Kannon temple. As the name suggests, this temple is dedicated to motherhood. The statue of eleven-faced and thousand-armed Goddess is enshrined in the main shrine, and the Goddess will fulfill the wishes of hopeful mothers. Accordingly, many women visit Mama Kannon to pray for success not only in breastfeeding and the curing of breast cancer, but also for children’s growth, and for finding love. Some of them even pray for bust enlargement or reduction. That’s why, the temple is sometimes called Mama Milk Buddhist Goddess of Mercy, or the Milk Temple. There may be only a few temples dedicated to milk in Japan. In the precincts of the temple is a mechanical statue of Buddha, from which water flows out as breast milk for you to clean your hands. At the temple talismans and votive tablets shaped like breasts are sold, and women often buy these items and wear them or hang them on trees around the shrine. Though their facial expressions while praying look serious there is something pleasant and charming about the scene. There are many single women and parents with children visiting as well as the occasional couple hoping for a happy relationship.